The Sony Xperia M2 ultra notified us for an Album gallery update once we configured our accounts. After the updated we got the same app that comes pre-installed on the KitKat-running Xperia Z2. Images are organized into groups of thumbnails and sorted by date. You can change the thumbnails size by pinching. Unlike previous versions there isn't a homepage that hosts all of your albums, instead you get the same swipe-able menu the app drawer is offering. There you can find all of your online and offline albums. The gallery can connect to online albums (PlayMemories, Facebook, Picasa, Flickr) and also to other devices on the local network. Maps and Globe albums are also available, which use the geotagging info to sort photos by the location at which they were taken, and faces, which groups photos by the faces of the people in them. The video playing app is dubbed Movies and it too has a great custom UI. It's connected to Gracenote, which helps you find additional information about the movies and TVs you have on the phone. It will even download posters for them and for movies, it will download metadata like genre, synopsis, director and cast. Unfortunately, this doesn't work very well for TV shows - it doesn't recognize the S01E02 format and won't pull info about individual episodes. It gets worse, Gracenote seems to be lacking info on TV shows in general, we couldn't find even popular shows like The Big Bang Theory. The video player does play 1080p files but only as long as those are XviD AVI files, as well as MP4 and MKV files. However DTS and AC3 audio tracks are not supported, which makes the MKV compatibility rather questionable. We know you can always get a proper app from the Play Store but it's a shame you can't just use the eye-candy default player for everything. On the positive side the video player supports subtitles, and you can customize their looks. Unfortunately, you cannot manually pick the subtitle file, it has to reside in the video folder to load up. The Walkman music player got updated with the Album app upon the phone's initial setup too and is now the same the Xperia Z2 has. It is part of the equipment of all recent Xperia smartphones. It features Music Unlimited integration and is not above trying to sell you songs, but you can hide the Music Unlimited stuff. The Walkman interface is based on a hidden swipe-able menu that sort your music collection by Artist, Albums, Playlists, all songs and even the songs your friends are listening to (but you need to connect the player with your Facebook account). You can pop up the menu the same way you'd do it in the app drawer or the gallery - just swipe from the left edge of the screen. The Music Unlimited stuff includes ways to discover new music - Charts, New releases and Channels. Those can be hidden individually (same goes for the artist/album/playlist tiles) or you can disable the service altogether. The Infinite button is available in the Now Playing screen (just tap the album art) - it will help you find the track's video on YouTube, look up info about the artist on Wikipedia and search for lyrics on Google. Gracenote is used here too and it can automatically download information about your tracks and album art. The Walkman player offers a variety of audio settings - ClearAudio+ option is here, which determines the best audio quality settings depending on the song you're listening to. We liked how it changed the music and carefully accentuated various details. Dynamic normalizer evens out the differences in volume between tracks, which is great if you've mixed multiple albums from multiple sources. The Sound enhancements contain yet more settings. There's an equalizer with presets and manual settings (including tweaking Clear Bass). Then there's Surround sound mode, which imitates the Studio, Club or Concert Hall experience. The Clear stereo mode enhances the perceivable stereo channel separation. Dynamic normalizer minimizes the difference in volume between songs (great if you're playing a shuffled mix). Speaker settings include Clear Phase, which adjusts the quality, while xLOUD boosts up the internal speaker. 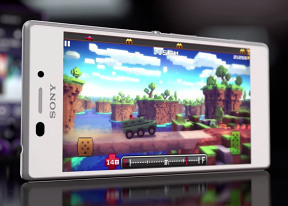 The Sony Xperia M2 also features an FM Radio aboard complete with RDS support. The app offers multiple visualizations and integrates with TrackID to recognize the currently playing song. The Sony Xperia M2 did well in both parts of our audio quality test as far as the cleanliness of its output is concerned. 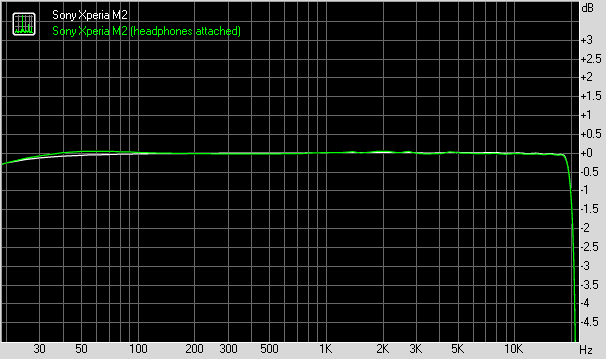 It demonstrated spot-on frequency response and there was no distortion in either case. The noise level and dynamic range, while not the best, are still excellent. The only problems with the performance of the Xperia M2 were (1) the rather large bump in stereo crosstalk when we plugged in a pair of headphones and (2) the very low volume levels in both parts. You probably won't listen to anything at maximum volume with the stock headphones (in fact the smartphone will warn you against doing that), but if you have another pro-grade pair, that might turn out to be an issue.